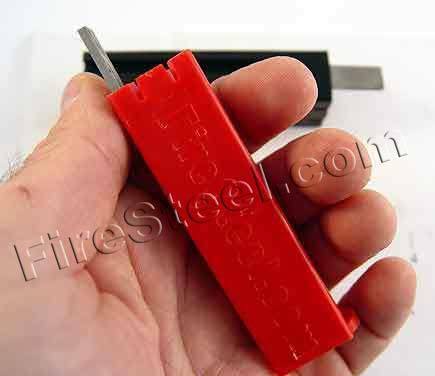 The FireSteel Palm Scraper™ by FireSteel.com takes fire making gear to a whole new level. To use the Palm Scraper™, grasp the handle in the palm of your hand. 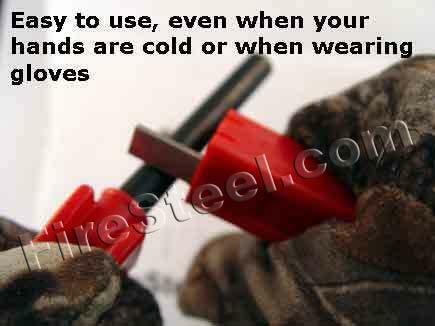 This means that you can easily use it even when your fingers are too cold to function properly or you are wearing gloves. What's more, the Palm Scraper handle is hollow. The matching GobSpark Armageddon FireSteel Rod (sold separately) securely snaps into the Palm Scraper handle so that your FireSteel is protected. The metal scraper (striker) blade that is attached to the Palm Scraper is made from the exact same ulta-hardened steel as as the famous FireSteel.com Super Scrapers, so you know you'll get massive showers of sparks. Even if you do not own a GobSpark Armageddon FireSteel, the Palm Scraper is a great addition to your firemaking gear because it will work on any other FireSteel rods. This is especially welcome news for customers with limited grasp strength whether due to the cold, gloved hands or conditions such as arthritis. It is much easier and you get a better purchase when you grasp the handle of a Palm Scraper with your whole hand than when you pinch the handle of a Super Scraper with just a few fingers. Think nothing is made in America anymore? Think again. The handle of the FireSteel.com Palm Scraper was designed and is injection-molded (manufactured) right here in the United States! You can also order the complete GobSpark Armageddon FireSteel Kit here. I reviewed the GobSpark on that page and this striker was part of my purchase. While this striker can be used with any fire steel I don't see why you would order one without also ordering the GobSpark because they are made for each other. It has the same day glow orange colour, fills the hand which is great when you have cold fingers, and can be used with both gloves and mitts. When ordered it together came with 2' of good paracord but I added 5' of para cord wrapped around itself to give me more cord that works the same as the 2'. The Palm Scraper is a MUST. Makes it a whole lot easier. This is without doubt one of the better ferro rods available. It does live up to the name Gobspark. Mine lives in my pocket so I'll easily have fire where ever I go. My hands are arthritic and the large handle on the Gobspark is easier to grip when your hands are hurting so badly that your grip is weakened. I also bought the palm scraper with my Gobspark. They work very well together. I wish that I had had one of these when I was in the SeaBees. While the small scraper does a great job, the Palm scraper is designed to be more comfortable to use under harsh conditions. Like it's little brother, it throws a shower of large, white-hot sparks, and you can grip it better. Every job needs the right tool, found it. used in winter and summer, it never fails. I first ordered it on the Armageddon firesteel, but have ordered more. It's light and it's simple to get loads of sparks, anytime. Have one ready for the ARMAGEDON! While the super scraper works the palm scraper RULES! I will be getting one for all my ARMAGEDONS. Trust me it is the best! The palm scrapers seem to have a sharper edge for striking. I have spent some time now experimenting with various scrapers on both my Gobspark Armagedon and some cheap mischmetal rods and the palm scraper consistently outperforms every other type of scraper. Add to that very fast shipping and friendly customer service and you just can't beat this product.